When we operate PDF documents, at the PDF header and footer area we can add some additional information to make the PDF more attractive and readable. In this post, I'll give you an example of how to add a header and footer when creating a new PDF document in Java applications. Get two jars which should be referenced to your Java project - Spire.Pdf jar and Spire.common jar. Free Spire.PDF has a class named PdfPageTemplateElement which represents a page template element that can be used as header, footer, watermark, or stamp. The template can contain text, image, as well as, dynamic fields like PdfPageCountField, PdfPageNumberField, etc. We use text string for the header and dynamic fields for the footer in the following example. //Add two pages to the PDF document and draw string to it. 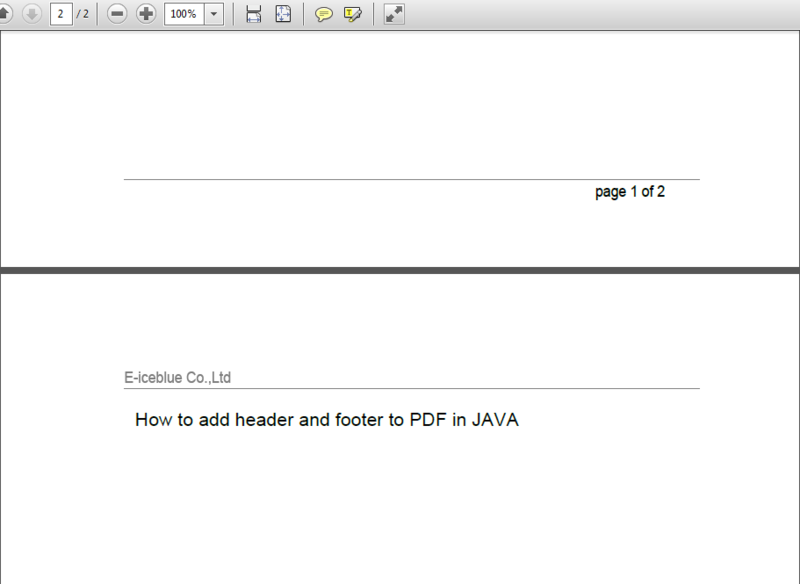 Here is an effective screenshot after adding header and footer to the new PDF document in the Java application.